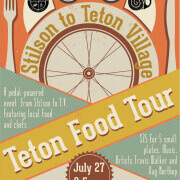 We will be joining Friends of Pathways and Slow Food in the Tetons for a day celebrating our incredible local food and pathway system – and the protected open spaces along the way! Meet at the Stilson Parking Lot between 1:30 and 3pm to pick up your tickets and map. 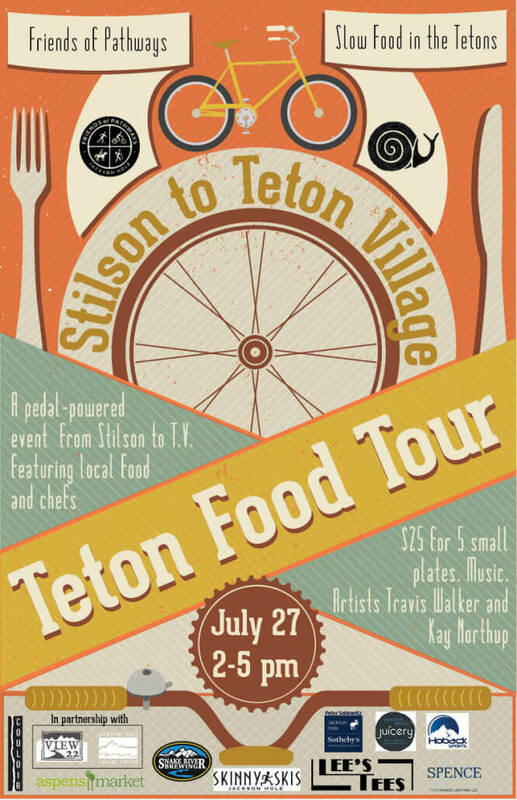 Friends of Pathways will host a bike valet for people who want to drop their bike, park at Teton Village and ride the bus or shuttle back to Stilson Parking Lot. Hoback Sports will be at the check in to help cyclists. When you check in, you will receive a map of the stops along the way and then you’re off to taste five small plates. Take your time, enjoy the incredible open space, our pathways, and the fine local cuisine. At the end of the ride, Teton Village hosts the weekly Concert on the Commons. We hope you’ll have time to enjoy the show while you have your final small plate. The Snake River Ranch stop will feature three artists from the View22 Project – Kay Northup, Lee Riddell, and Travis Walker. Thank you to the Snake River Ranch for hosting this location to highlight the Land Trust protected open spaces in this stretch of road!